The Philippines economy has witnessed a drastic change, an economy based only on agriculture to a newly industrialized country. Today the major contributors to the economy are the services and manufacturing industries. This industrial revolution in the Philippines has given many career opportunities to the Filipinos. best cities to live in the Philippines. It is home for the two television networks of the Philippines and many times referred to as Hollywood of Philippines because of the presence of the TV celebrities. The booming economy offers abundant job opportunities and can cater to a wide range of lifestyle. Makati is the heart of Metro Manila. It is the most cosmopolitan city in the Philippines and can be easily called the New York of the Philippines. Makati is the home to foreign embassies and offices of global organizations. It has a high concentration of talented workforce coming from all over the world. This is one of the highest in terms of GDP per capita and one of the richest. The city provides an unlimited range of cultural venues and is known for its wildest nightlife. Cebu is the center of commerce and industry in the Visa as a region and provides excellent job and business opportunities. It has a flourishing BPO industry, corporation and multinationals thus creating plenty of job opportunities. Cebu city is one of the major tourist attractions in the Philippines owing to its rich culture, history, and economy. This city has tourist attractions for each member of your family; from historical monuments, beautiful architecture, pristine beaches, scuba diving, and all adventurous water sports. Manila the capital city of the Philippines is densely populated. The term Manila is commonly used for the whole metropolitan area, greater metropolitan area or the city proper. The proper city of Manila is only one of the big cities of this urban agglomeration. Manila is the total urban area that is composed of different cities and the surrounding urban fringe. Manila is the business and cultural center of the Philippines. Manila is a major center for commerce, banking and finance, retailing, transportation, tourism, real estate, media, advertising, legal services, accounting, insurance, theatre, fashion, and the arts in the Philippines. It is the major hub of the BPO industry and offers abundant career opportunities. This city offers many career opportunities and thus people tend to stay here for the job prospects. This is the best city to live in, in the Mindanao. It has the largest land area compared to any other cities in the Philippines. Davao city has a flourishing business and tourism economy and offers great career opportunities to people living here. This city also has world-class malls, hotels, and hospitals. 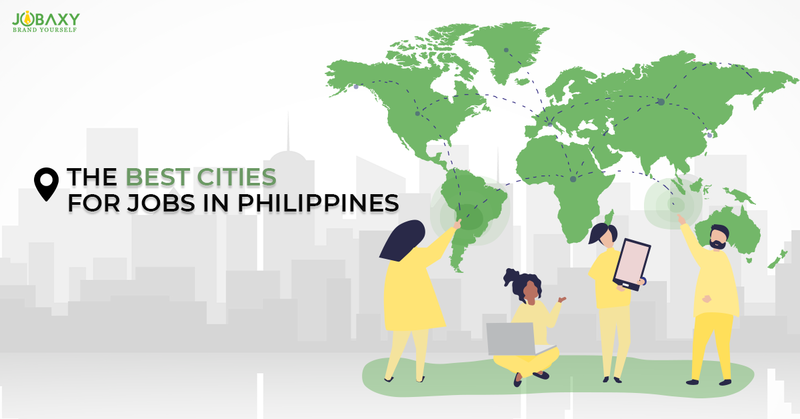 These are some of the cities that are best to work in the Philippines. For the best jobs in Philippines, visit us @jobaxy. We have jobs listed from the nook and corner of the Philippines.